Discussion in 'Battle Reports' started by Itepixcauh, Dec 4, 2017. Time for the second game of the league, this time against a player I have a very good vibe with, also all our games are extremely tight. We are specially competitive against each other and that always makes for a really fun game, you can check our previous Battle Report HERE. Scenario we have to play is INVADE! so let's get cracking. 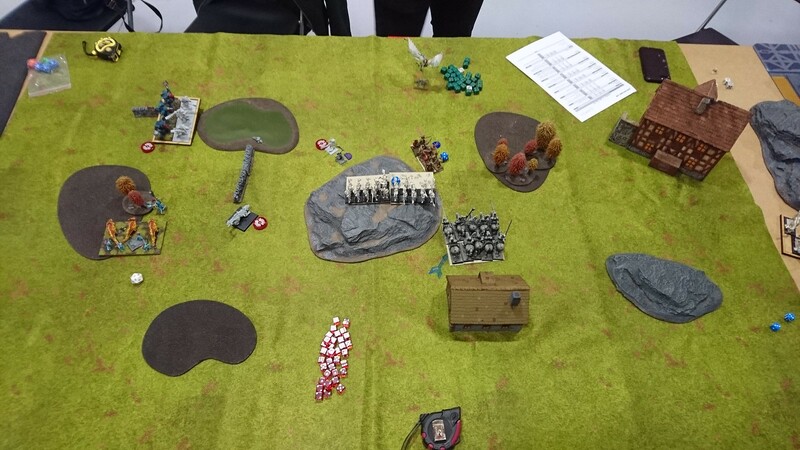 I think he won the roll and made me deploy first so I did, my whole plan was to place my Kaisenors against his Honour guard if posi9ble but mainly to know the placement of his Guns to place my flying heroes accordingly, I think I did a pretty good job. My plan was to hold the centre as much as possible with the Ancients while I kill one or two of his units there, while avoiding the tar pit that are the Dogs of War. Meanwhile the FEs will be sent to kill the left flank and move onto his side, giving me a very solid 6 VPs to play with. He won the roll AGAIN and made go first, which I didn't wanted to because of all the 24" reload shooting that he has, but well, it seems I will be one turn short this game. I decided I didn't like his shooting at all so I moved my two flying heroes into position, the Battle-Captain hugging the forest in front of him so the Crossbows can't see him and the Skylord taking the long route behind the house on the far right to gain the rear of his army (NICE!) the rest of my army stood still. 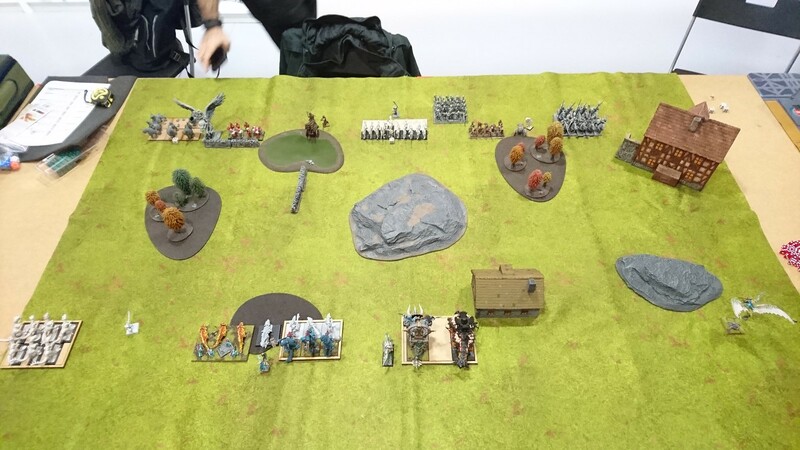 He decided not to play the waiting game and moved forwards almost everything, including the volley gun and crossbows on the right, shooting units on the left stood still. 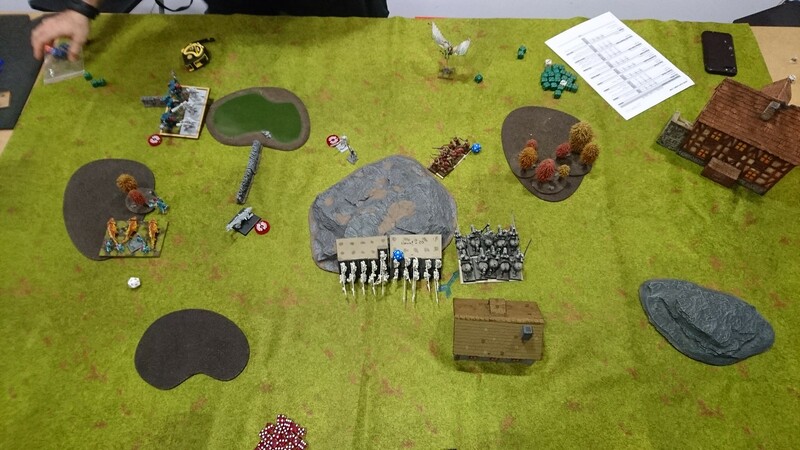 He opened fire onto the Battle-Captain with the Volley Gun and managed THREE wounds, that's a really good roll. On top of that he rolls really high and Wavers him! My plan is starting to crumble fast. He had given me a charge on his Honour Guard with my Lancers, that was too juicy not to take, even if hindered. If my Battle-Captain hadn't been Wavered I could have moved him to the edge of the forest to prevent the Hindered charge. I instead use his free pivot and a backwards move to take him out of the way. My whole line moves forwards and I surge the Nimble FE into the forest to have them protected and also bait the Duke into hopping over my line or charging them and I have the Lekelidon shoot the Duke. My skylord positions and shoots the Volley gun, wavering it. Nice start for the turn. Strangely my Lancers seem to overperform when hindered and as always they go great!, putting 6 wounds into the Honour Guard, that is more or less the average they should do un-hindered, impressive. Sadly the Nerve roll isn't as good. The rest of his combat units advance, while the Knights turn to face the middle. His shooting units stay still to lay some pain. 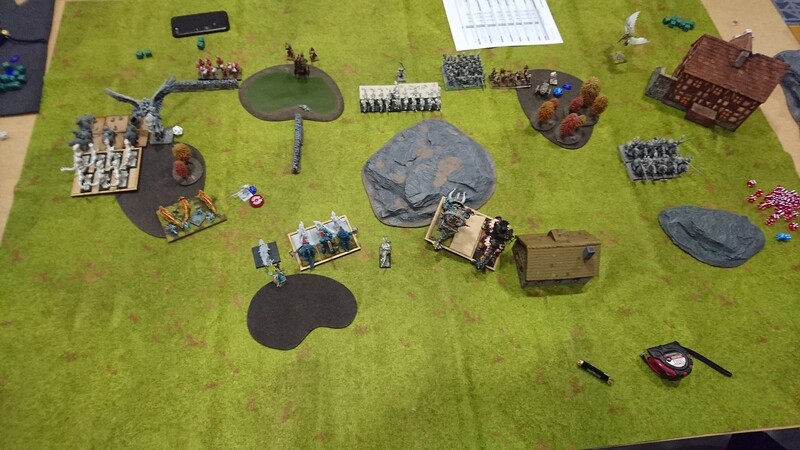 He shoot both units on the left into my normal FE horde making some wounds but not much, the crossbows on the right try to shoot the Ancients but miss. 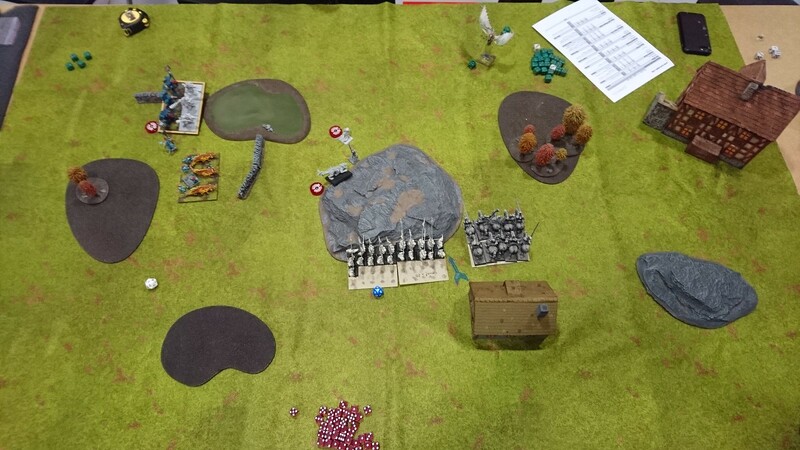 Combat goes as expected and the Lancers perish bravely, he reforms to face the incoming Fire. I decided to go all in, I charged my Nimble FE into the Honour Guard, hoping to pop them, my Ancients into the Spear Militia Regiment and both my Flying heroes into his Volley Guns. My logic behind this was as follows, I knew I could take the left flank and have my both Hordes of FE alive and well, that will grant me 6 VPS, he had 7 posible VPs in the centre (1 horde and two regiments) si if I kill the Militia that leaves him 5 VPs of hard to kill things and a mathematical victory for me, I wasn't thinking on the fate of the Ancients afterwards. If I had cared to think about them I would have moved the Herald in front of the Dogs of War Horde to block their charge next turn. - Charge the Lekelidon, with just 5 attacks and Inspiring my chances are good of surviving, granting me a flank next turn. So it's a win-win situation for me. 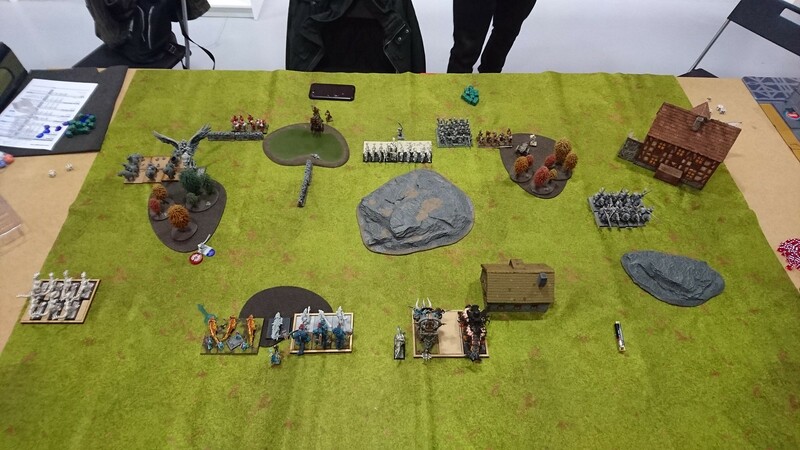 In the shooting I keep wounding the Duke with the Lekelidon and Mage-Priest. - FE do something like 8-9 wounds into the Honour Guard and routing them easily thanks to the sacrifice made by the poor Lancers. WHAT A TURN! only problem comes with the positioning of the Ancients, both the Knights and Dogs of War can charge them, only chance is to roll a 4 plus on the advance roll to scape the Horde arc, sadly I get a 1. so they are dead. I really have to think ahead and use my Individuals better, because had I moved the Herald in front of the Horde then I could have reformed to face the Knights that would have had a hindered charge on top of that. Still game is looking great right now. 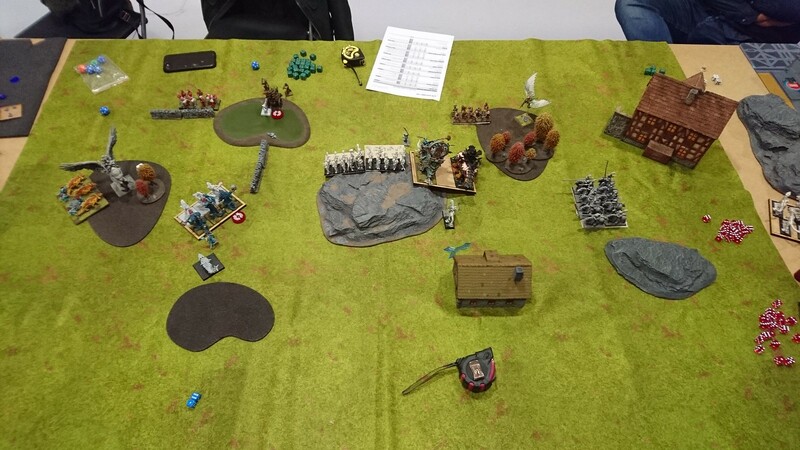 He takes the bait and charges my Lekelidon with his Duke, in the centre the Dogs of War flank the Ancients,helped in the front by the crossbows (ouch) while the Knights feeling that attacking the Ancients was an unnecessary call for a double 1, they attack the Herald instead. Wizard manages to put Bane-chant on the horde too. The centre combat goes as planed, 60 attacks with CS1 and Elite are just too much for any unit and my Ancients are no more. Same with the Herald, he went to meet his maker. The Duke attacks the Lekelidon but thanks to Inpsiring he holds not even wavered. I know I have the game in my pockets if I play it intelligently. I can secure 8 VPs with ease againts his 5. I start by charging my Nimble FE into the rear of the Duke, and the normal FE into the Crossbows behind the obstacle, I move the Lekelidon over the centre line too. 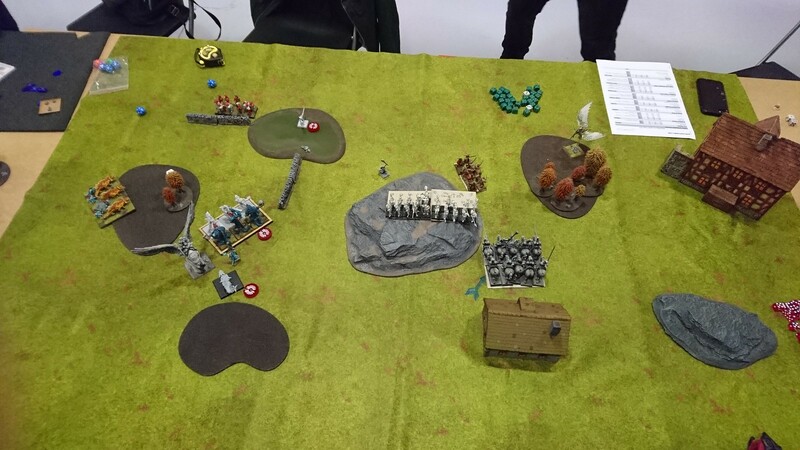 His wizard is a menace against my wounded Hordes so I charge him with the Battle-Captain and move the Skylord deep into his deployment zone to just shoot the troop of crossbows instead of risking a charge from the Knights. The skylord manages to waver the troop of crossbows with his shooting. In the combat phase the poor Duke runs down the curtain joins the Choir Invisible in a big explosion of fire, as do the Crossbows, bereft of life. The battle-captain wavers the wizard, and that is just enough for me. Nothing exciting really happens, I move my scoring units into his half and with the combined shooting of the Lekelidon and Skylord the Troop of Crossbows are finally pushing up the daisies. The Battle-Captain makes the wizard rest in peace. On his turn he just consolidates more into my half with his units but the game is settled, and we call it. 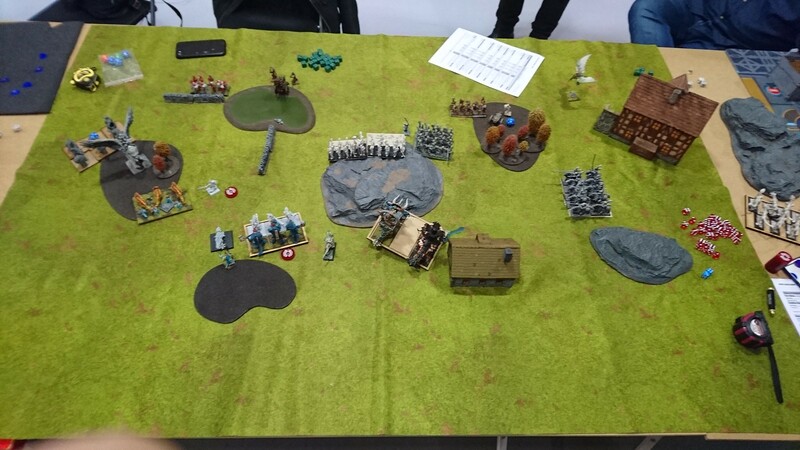 Really great battle report, and thanks for the pictures! Thanks for reading! A battle report with no pictures is like alcohol free beer, just not as fun. League of Rhordia... Aren't they Spanish Hobbits and their human allies? Yes theoretically they are a mix of Humans and Halfings but it's also the best army to represent the latest version of the Empire from Warhammer, with Demigryphs and such.